Accusing BJP and its state president B S Yeddyurappa of being behind the offer allegedly made Thursday night, H D Kumaraswamy said the MLA informed him that he had rejected the gift. 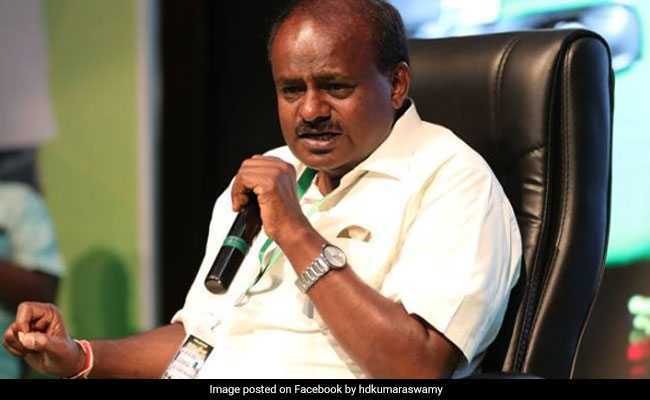 Karnataka Chief Minister H D Kumaraswamy Friday claimed opposition BJP was continuing its 'Operation Lotus' to topple the JDS-Congress government and tried to lure a Congress legislator with "gift". Accusing BJP and its state president B S Yeddyurappa of being behind the offer allegedly made Thursday night, he said the MLA informed him that he had rejected the gift. "'Operation Lotus' is on. Yesterday night also they have telephoned a Congress legislator, asking him where to send the gift," Mr Kumaraswamy told reporters in Bengaluru. The chief minister's fresh allegation comes days after Mr Yedyurappa had said the BJP would not destabilise the ruling coalition. In a return of resort politics, all 104 BJP MLAs had stayed in a hotel in Gurugram for some days recently while the Congress too shifted its legislators to a resort. Subsequently, the MLAs returned to the city last week. Four Congress MLAs had skipped a crucial legislature party meeting on January 18, indicating all is not well within the party. 'Operation Lotus' is a reference to the BJP allegedly luring several opposition MLAs to resign their assembly membership and defect and win the election on their party ticket later to ensure stability of its then-government headed by B S Yeddyurappa in 2008. In his media interaction Friday, Mr Kumarasamy, without naming anyone, said: "he (the legislator) has already informed me. The legislator has told them (BJP) that he don't want their gift and to leave him peacefully." "It is not a small gift. From where it (gift) is coming to Yeddyurappa? As Chief Minister in 2008 he had made similar attempts- making MLAs as commodities for sale, he has continued his work, it is his addiction, what can I do for it," he said responding to questions. Asked about the cost of the gift this time, he said, "It is hard to guess, you will be surprised," but did not elaborate. Speaking to reporters in Kolar earlier, Mr Yeddyurappa said there was confusion within the Congress and the ruling alliance and their MLA and his party had nothing to do with it. "...Let's wait and watch... what will happen because of their confusion within...we are not playing any game, they (Congress-JD(S)) are playing the game, let's wait and watch what will happen, he said in response to a question. He said there was no necessity for anyone to indulge in resort politics and the BJP with the "support" of the two independents now had a strength of 106 in the 224-member assembly. "We will be in the opposition and do our duty. I have given this assurance publicly," Mr Yeddyurappa said. Making it clear that there was no need for any confusion, he alleged the government was not focusing on development work and been in a deep slumber.